With 2012 being an election year after a census, congressional redistricting is a frequent news item. As in this article, gerrymandering is frequently cited as a major problem associated with redistricting. State legislators are often in charge of submitting new maps of their state’s congressional districts, so naturally they redraw the lines around a favored electorate to help their friends and fellow party members to stay in power. But, as with many things in the US, each state does it differently. I thought it might be interesting to see which states have the most gerrymandered congressional districts. Below is the resulting map, showing the relative “Gerrymandered-ness” of each state, for its districts in the US House of Representatives. A “Gerrymander Index” (GI) from 0 – 100 (where 100 is a perfect circle, or the least gerrymandered shape possible) was calculated for each district, using the following formula: GI = 100 * 4πa/p2, where a is area and p is perimeter. A badly gerrymandered district will have a low GI, meaning its convoluted shape requires a long perimeter in proportion to its area. The GIs for each district were averaged together for each state, and divided into four levels of GI as seen on the map. 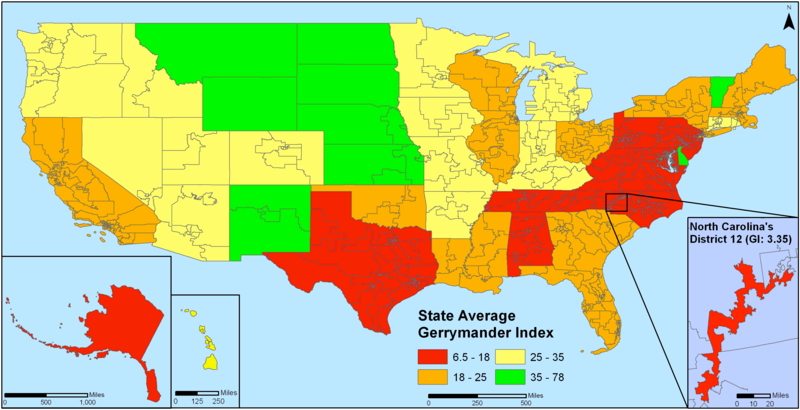 With an average GI of 14.19, (again, on a scale from 0 to 100) the most gerrymandered state in the country (putting aside low GIs due to geography, more on that later) is North Carolina, which also happens to have the most gerrymandered district in the whole country, North Carolina’s twelfth, with a GI of only 3.35. The only problem with this approach is that the results will show low GIs as a result of a convoluted geography. This can most notably be seen in Alaska, which despite having only one at-large district has a GI of only 6.57 due to its meandering coastline, and Maryland, which has a GI of 7.39, mostly because of the many estuaries in Chesapeake Bay. Conversely, states with simple geography and few districts will have the highest GIs. These geographic exceptions aside, a few trends can be seen in this map. Mid-size states in the south and mid-Atlantic regions, which have a long history of racial politics, are more gerrymandered than similar-sized states in the mid-west and west. Texas also appears to still be badly gerrymandered, despite a 2006 Supreme Court ruling that ordered the state to change a redistricting plan aimed at splitting up the Democratic vote to give Texas a Republican majority in the House of Representatives.